Geiger counter in bench use. A Geiger counter (sometimes called Geiger-Müller counter) is an instrument that measures ionizing radiation such as alpha particles, beta particles, or gamma rays. It is best known as a hand held radiation survey instrument, but it can also be used as a bench instrument or permanently installed. The original operating principle was discovered in 1908 and since the subsequent development of the Geiger-Müller tube in 1928 the counter has been a very popular instrument due to its robust sensing detector and element and relatively low cost. The radiation sensor is a Geiger-Müller tube which gives out an electronic signal when radiation is present. The readout is counts or radiation dose. The counts display is commonly "counts per second". Radiation dose rate is displayed in a unit such as the sievert. The readout can be analogue or digital, and modern instruments have communications with a computer or network. There is usually an option to produce audible clicks representing the radiation intensity. This allows the user to concentrate on manipulation of the instrument without looking at the display. For alpha particles and low energy beta particles the "end window" type of GM tube is used as these particles have a limited range even in free air and are easily stopped by a solid material. Geiger counters can be used to detect gamma radiation, and for this the windowless tube is used. A special type of the Geiger tube is used to measure neutrons. For hand-held units there are two fundamental physical configurations: the "integral" unit, with both detector and electronics in the same unit, and the "two-piece" design which has a separate detector probe and an electronics module connected by a short cable. There is a particular type of gamma instrument known as a "hot spot" detector which has the detector tube on the end of a long pole or flexible conduit. These are used to measure high radiation gamma locations whilst protecting the operator by means of distance shielding. In 1908 Hans Geiger, developed a technique for detecting alpha particles that would later be used in the Geiger-Müller tube. This counter was only capable of detecting alpha particles but in 1928 Geiger and Walther Müller developed the sealed Geiger-Müller tube which could detect more types of ionizing radiation and it became a practical radiation sensor. Once this was available, Geiger counter instruments could be produced relatively cheaply. 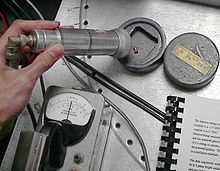 Wikimedia Commons has media related to Geiger counter.